Anyone ever watched the Will Smith movie, “Concussion”? The movie is based on the true story of Dr Bennet Omalu who is a Nigerian-born pathologist (a pathologist is a forensic specialist who is able to determine the cause of a person’s disease and death). Dr Omalu became curious as to why otherwise healthy middle-aged men were displaying changes to their behaviour and memory before dying at a young age. What he found was changes to the brain of these NFL players similar to that seen in Alzheimer’s Disease. The recurrent physical head trauma sustained by those football players was resulting in abnormal proteins in their brain cells. The abnormal proteins resulted in the destruction of those brain cells. As a result of the destruction of those brain cells, the thinking and behaviour of those players changed. After initially denying the link, the NFL was forced to change their policy on repetitive head trauma under the weight of the avalanche of confirmatory data that followed in support of Dr Omalu’s findings and it’s been reported that “as of the summer of 2015, more than 5,000 former players were involved in a consolidated lawsuit, with a settlement figure of $765 million deemed insufficient by a judge”. Maybe she can act for the NFL as their star witness. How is the mind going to control the brain if they’re separate? Suggesting that one thing controls another carries the implication that they are intrinsically linked. If your hands are separated from the steering wheel of your car, are you in control of your car? 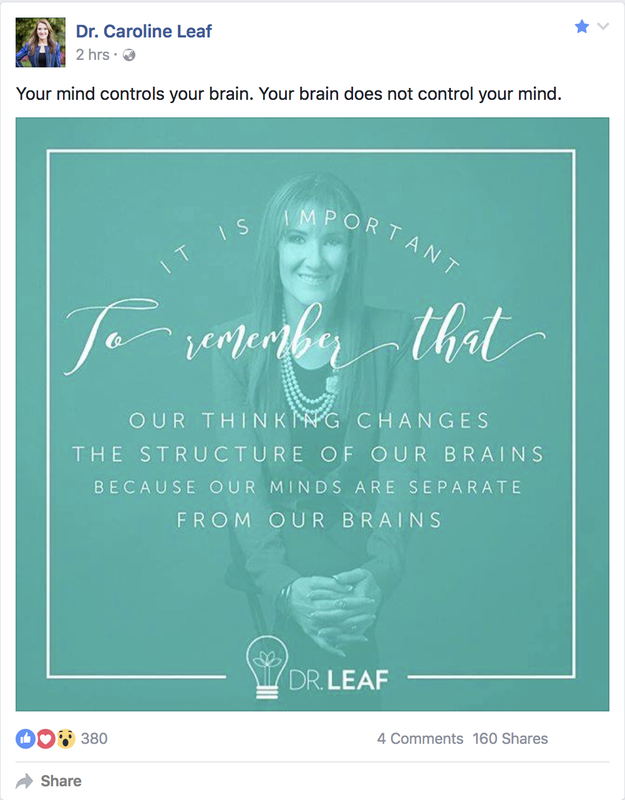 The other reason why Dr Leaf won’t be getting a call from Roger Goodell any time soon is because she isn’t really an expert on cognitive neuroscience as much as she’s convinced the Christian church otherwise. Oh, and then there’s that minor detail that even Hollywood knows more about cognitive neuroscience than she does. The whole point of “Concussion” is that brain damage results in disordered thinking which is the exact opposite of what Dr Leaf is trying to claim, and it’s hard to withstand any real scrutiny when your hypothesis has been trumped by a Hollywood screenplay. The mind is a function of the brain, it does not control the brain. The fact that Dr Leaf can not or will not bow to the weight of the undeniable scientific evidence means that she is either delusional, ignorant or utterly obstinate. The fact that the western church is still willing to deify Dr Leaf in spite of these qualities is a stain on the reputation of the church and a blight on it’s witness to a world which only needs to look to Hollywood to find more credible information than what’s coming from Dr Leaf’s pulpit.